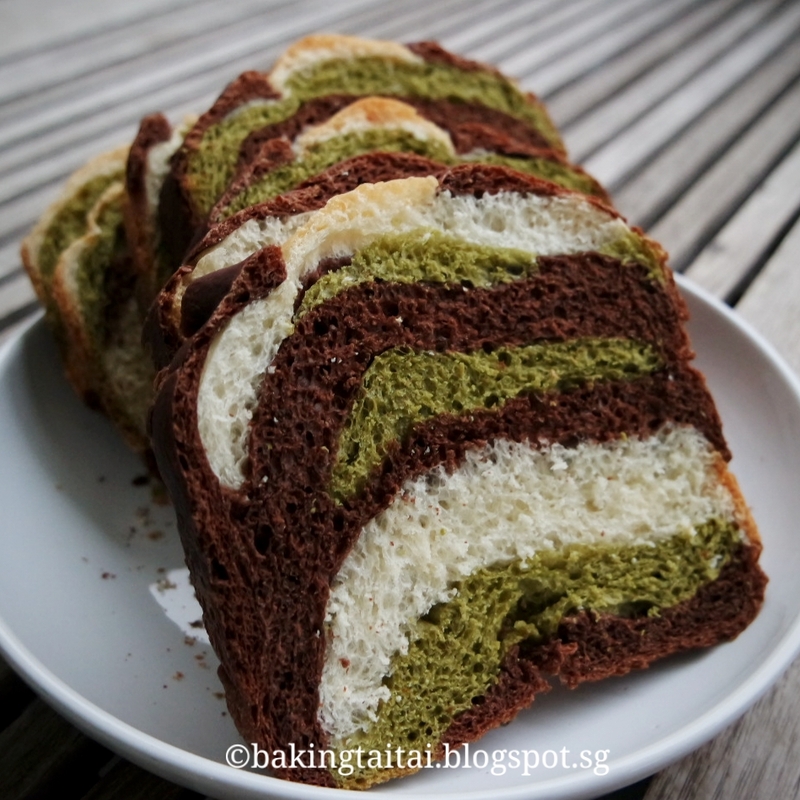 Bake this soft and fluffy all natural camouflage loaf to cheer my little one up as he has been suffering from frequent nose bleeding due to block nose caused by the haze. Wishing the haze to go away soon as I miss the sun, blue sky and fresh air!!! 2. Select pasta program. (Kenwood BM250 - select program '9' , this cycle takes 14 minutes to complete.) Add the butter in during half way of the kneading progromme. 1. Add the cocoa powder and water to the plain dough, knead till well mixed and shaped it round. 2. Add the matcha powder and water to the plain dough, knead till well mixed and shaped it round. 3. Remove the plain dough from the fridge, together with the cocoa and matcha dough, put it into a container, separate by cling wrap. Cover and proof for 40 minutes or until double in size. 4. Divide each colour dough into 5 equal portions. Roll it round and rest for 10 minutes. 5. Flatten the dough with a rolling pin, stack the dough in the bread pan as you wish. 6. After finished stacking, cover the bread pan with a wet cloth and proof for 60~90 minutes. 7. Select the bake function to bake the bread. 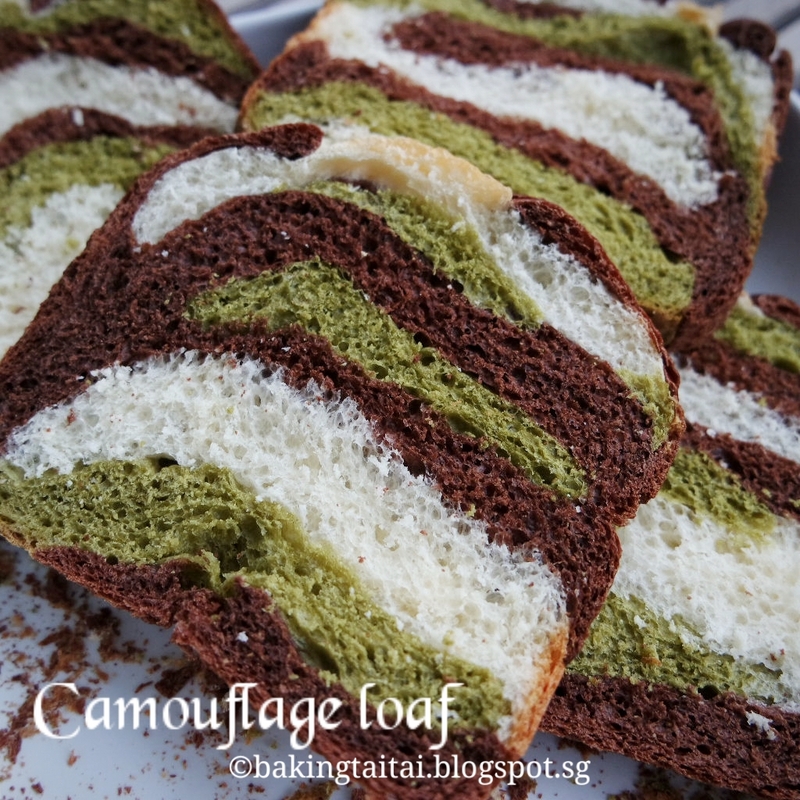 Still i haven't seen in my life like this camouflage bread loaf. Looks like this loaf is going to be perfect to make my breakfast. Oh yea thanks for this one besides all yummy recipes. Hi, if using normal oven, what temperature to set and how long to bake? Thanks in advance for your advice. Hi Karen, if using loaf pan bake at 170~180 degrees Celsius for about 40 minutes and if using pullman tin bake at 200~220 degrees Celsius for about 40 minutes. Temperature and timing are just suggestions, you will still have to adjust according to your own oven as every oven has different thermostat. Hope this helps. I follow the exact portions. I notice my plain color dough is very sticky and hard for me to roll into individual round portions to even rest. All stuck to my hand. The cocoa dough potions are much easier to make into individual portions. May i ask why? Or how should i make it less sticky so that i can make into smaller individual rounds in an easier way? Thanks for your advise. Hi Fenni, even if you follow exactly the same portion as my recipe, there will still be some differences unless you use exactly the same brand of ingredients as I do. Different brands of ingredients have different composites. Eg. 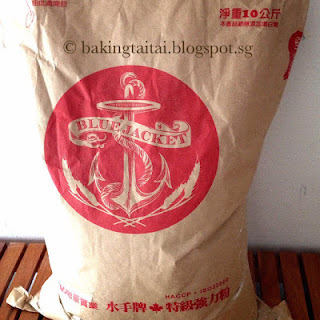 I have used the Blue jacket bread flour which has high water absorbency as compared to other brands of bread flour. If you find the plain dough too sticky and difficult to handle, you can floured or oil your hand to handle it.